Breakfast in India usually consists of a hot cup of masala chai (tea), tea cookies and a lightly spiced dish or a spicy dish. The type of breakfast you get to eat varies widely depending on which region of India you live in or visit. The southern part of India usually serves spicier dishes compared to the northern or western part of India. I am mostly familiar with the culture in North, West and South India. I have never been to the eastern part of India. If any of you have been there or are from the eastern part of India, please add your comment as to the type of breakfast served there. This is one of those dishes that I have grown up eating. Anytime we had guests visiting, I would see my mom make all kinds of breakfast dishes. She would make some hot ginger, clove and cardamom chai for the adults and hot ginger milk for the kids. She would make poha and add some coconut shreds in a flat bottomed steel cup along with chopped cilantro and then add the cooked poha to the cup. Then she would flip it on a plate which gave it a nice round shape. This was more to make it look nice and neat than anything else. 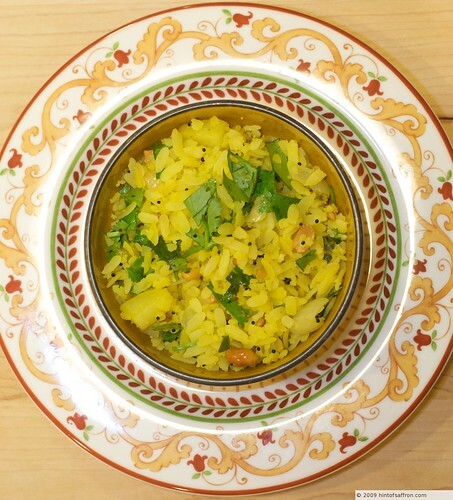 This dish is made with Poha. What the heck is Poha you ask? Poha or flattened rice flakes is made out of rice which is husked, cleaned and soaked in hot water. It is then pressed under rollers & dried. These off-white, paper thin flakes are very light and bland in taste. It can be roasted, fried and made into sweet and savory dishes. 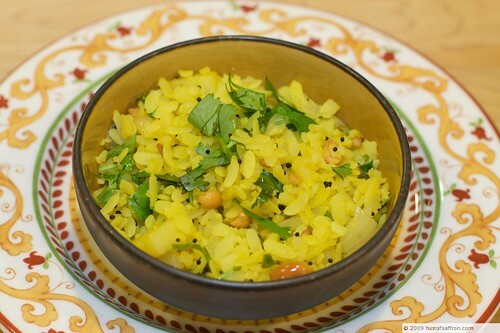 Poha is a popular ingredient to make a variety of dishes for breakfast or snacks. Being from the western part of India, I used to enjoy eating snacks that were made with Poha in lieu of Popcorn. It is hard to stop snacking on it. Looks like I will need to call my mom and find out how to make Chivda (snack made with Poha) and will post that recipe too. It is one of my favorite all time snacks apart from popcorn. Indians like their dishes spicy and this dish is no exception. I like to make the popcorn spicy when popping the corn by adding some garam masala and ghee and then the popcorn kernels. They taste awesome! I will post that too but I digress. This is how Poha looks like. 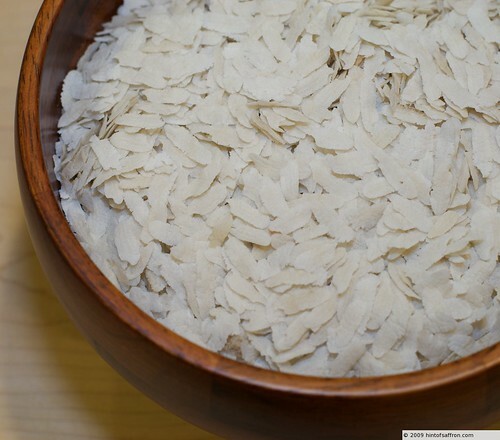 It is a very versatile ingredient in making a variety of dishes. 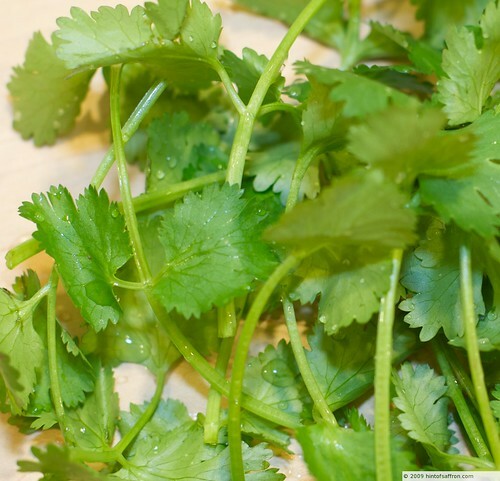 One of my favorite herbs is Cilantro. It is an absolutely essential ingredient in almost all the dishes and for making all kinds of chutneys. Some of my friends who hate cilantro started liking it after I made some chutneys with it. They could not believe it could taste so different than what they were used to. Here is how the dish looks once done properly. It is excellent for a light breakfast or snack. It is not only healthy but tasty. Here is another photo of the recipe. Feel free to substitute cashew nuts if you are allergic to peanuts. Rinse the poha in a bowl 2-3 times. Add enough water so it just covers the poha and let it soak for 15 minutes. Drain and add turmeric to the poha. While the poha is soaking, add the oil to a non-stick pan on medium-high heat. Lower the heat to medium and add the mustard seeds. Make sure to have a screen or a lid handy. Once the popping subsides, add the urad dal and fry till it turns light brown (approximately 30 seconds). 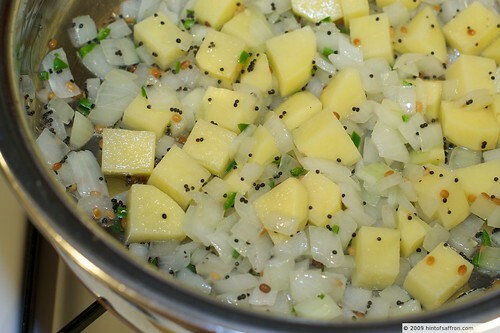 Add the chopped onions, potatoes and green chilis and cook till the potato are softened. Add salt, peanuts and poha and mix thoroughly and cook for a minute or so. Add the juice of half a lemon and fold in the cilantro.